Your primary care veterinarian is qualified to handle many of your pet's health issues. Just as in human medicine, however, sometimes a specialist's expertise is needed. 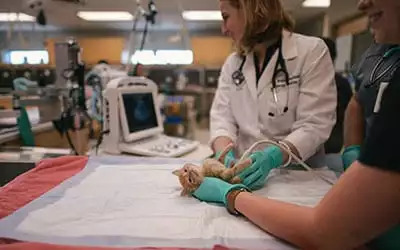 So your primary care veterinarian may refer your pet to a board-certified veterinary internist to help diagnose or treat a particularly complex medical condition. 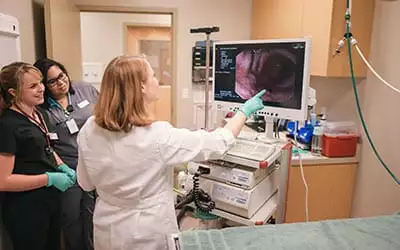 A board-certified veterinary internist is an internal medicine specialist—a veterinarian who has completed advanced training in how your pet's internal body systems function, and in diagnosing and treating the most serious diseases that affect these systems. Interventional radiology (IR), advanced imaging techniques that guide the placement of materials, such as stents, for diagnostic and treatment purposes. This minimally invasive approach offers shorter hospital stays, decreased pain, and a faster recovery compared to open surgery. Once we've diagnosed your pet's condition, we'll discuss all the available treatment options and come up with a plan that you’re comfortable with—medically and financially. Treatment is always tailored to your pet’s unique situation and your family’s wishes. Throughout your pet’s diagnosis and treatment at Powers, we keep your primary care veterinarian fully informed. This is important because, in many cases, your primary care veterinarian will continue to manage most of your pet's ongoing medical care. To make a referral or schedule a consultation with Powers’ internal medicine specialist, please call us at (719) 473-0482.